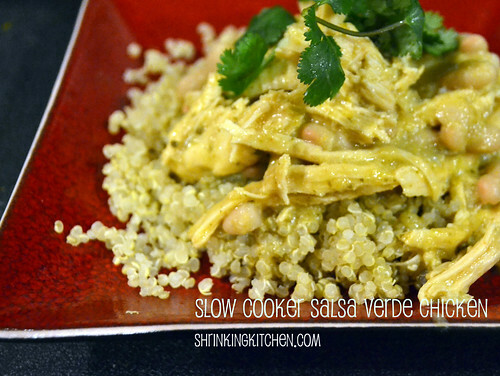 Slow cooked chicken in salsa verde sounds complicated – but honestly, this is probably one of the easiest slow cooker recipes I have in my arsenal. You can even throw the chicken in the slow cooker FROZEN. Yes, seriously. It really doesn’t get much easier. Even if you forget to start your slow cooker till the afternoon, you can still enjoy this dish in about four hours – just set the slow cooker to high. Use your favorite jarred salsa verde – I have used Herdez, Pace and Trader Joe’s brands, all with amazing results. Make a bunch – you’re going to have to fight your family for the leftovers! Place chicken in slow cooker (frozen or thawed, doesn’t matter). Mix all other ingredients, except sour cream and beans, and pour over chicken. Add sour cream and beans into the sauce, stir well. Place chicken back in the slow cooker. When beans are warmed through (about ten minutes), dinner's ready! Serve with either by itself, kind of like a soup, or over quinoa or brown rice. Weight Watchers Points Plus are based on chicken and sauce only. Starch not included. Nutrition calculated using low fat sour cream and unrinsed beans - you can lower sodium and calories by draining and rinsing your beans and using fat free sour cream. I am making this next week! Yum! Can this be done with pork? I bet pork would work perfectly! If you try it, let us know! I made this the other day and ate on it for two dinners and two lunches and wasn’t even CLOSE to being sick of it! SOOOO yummy! I picked up some fresh-made whole-wheat tortillas from our local market (they make them in front of you and they’re still warm when you buy them) and topped them with the chicken mix and salad greens for a bit of crunch and to sneak in some more veggies. I will definately be making this again! I made this tonight and found it somewhat bland… Like it was missing something. Probably won’t make this again. I tried this recipe tonight and it was great before I added the sour cream. I put the chicken in frozen and after 4 hours it was very tender and flavorful. I will definitely make it again but will probably only add a half cup of sour cream or none at all. Happy cinco de mayo! Thank you for this blog!!! Trying to make healthy meal choices but want the convenience of slow cooking often!! I will definitely try this recipe! This was a great and EASY recipe to make! I left out the beans, used it in sift tacos and topped with some pico… Delicious! So good! Made without sour cream but did burrito style so family members added it if they wanted. Delicious. I made this tonight, subbing nonfat yogurt for the sour cream, and my family RAVED about it. I tasted it before adding the beans and yogurt, and it was great then, too, though a little spicier than some family members could handle. The yogurt tamed it nicely. We ate it in flour tortillas. I think this would also be great over a grain of some sort, or as a nachos topping, or on a salad! My husband told me that this one definitely goes into the rotation! I made this tonight and it was delicious. We had it with tortillas, but only because I forgot to make the rice. I meade this last night and the family lapped it up! I added 3/4 cup of chicken broth and it made a little more juice so I used that to make a “gravy” over brown rice. I also used greek yogurt instead of sour cream. The beans were perfect in it….love love love this recipe! I made this tonight! My kids loved it…as well as the 1 year old! I used fat free sour cream to help offset some of the spice! We will make again! I also used brown rice! Perfect!